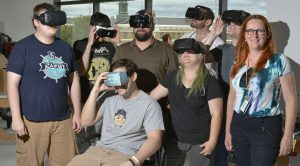 OSWEGO — A German virtual reality software developer recently announced a partnership with SUNY Oswego, helping push VR research and learning opportunities forward in the college’s graduate program in human-computer interaction. Computer science faculty member Jolanda Tromp (right) joins students in a Shineman Center lab modeling the college’s virtual reality headsets, most of which were provided by German VR software publisher Crytek in connection with its recently announced VR First industry/academic partnership with SUNY Oswego. In back (from left) are human-computer interaction graduate students Jordan Hermann, Chris Stultz, Ryan Kikta, Nick LaCross and David Swift. In front (from left) are HCI student Kris Saber and senior computer science and biology dual major Rose Fontana. Computer science faculty member Jolanda Tromp said Crytek’s VR First academic initiative has provided impetus for establishing the college’s first dedicated virtual reality lab in Shineman Center, as well as providing five state-of-the-art VR headsets and the company’s CryEngine platform for software development. Involved in virtual reality research since her graduate psychology work at the University of Amsterdam and doctoral research at the University of Nottingham in the mid-’90s, Tromp said she learned of Crytek’s industry/academic collaborations through contacts in the field. VR First is an initiative to facilitate the creation of virtual reality labs at colleges and universities, with the aim of building a worldwide network of VR developers who share in a global knowledge base and exchange network. Besides SUNY Oswego, partners include Purdue University, University of Florida, Oklahoma State University and at least two-dozen other institutions in six countries. Virtual reality — the three-dimensional simulation of an environment that enables user interaction in a seemingly real way — has been around for decades. Tromp said developers are now riding a “third wave” of interest in VR applications. Students in Tromp’s graduate-level course in virtual reality last spring began diving into research to apply VR software to applications that go beyond games into the realms of medicine, marketing, anorexia treatment, meditation, psychotherapy, space travel, engineering, journalism and more. Ryan Kikta, a second-year graduate student in human-computer interaction (HCI), has been working under Tromp’s mentorship on a software application called Analgesia, designed to assist people with dental phobias, lengthy burn treatments or other pain-management situations. Through the use of a virtual reality headset, patients are distracted from ongoing treatment though immersion as they experience the sights and sounds of a non-medical virtual environment. Preliminary studies show this may make for a significant decrease in the need for anesthesia or prescription painkillers, Tromp said. Kikta was among students accompanying Tromp this summer to Spain’s University of Granada, where research is under way in applications that provide virtual rehearsal of life skills. For example, second-year HCI graduate student Jamie Garcia continues to research an application to create touchstone “memories” for people with early-onset dementia. HCI student Chris Stultz said he is doing an experiment to determine how older people react to virtual reality software — to mixed results so far. Virtual applications have mushroomed as interest in VR software and hardware have surged. Tromp said there are programs to provide training for machine repair in dangerous environments; to travel through the human body, see its anatomy up close and practice surgery; to get inside molecular structures in biology and chemistry; and to pre-analyze engineering designs of complex devices. Tromp, who has been invited to provide a VR design workshop at Massachusetts Institute of Technology this fall, will offer the graduate-level virtual reality class again in Oswego this spring. As work continues on equipping the virtual reality lab, Tromp said, she has received a curriculum innovation grant to develop the class as a permanent cross-disciplinary course. Undergraduates — anyone on campus — can propose projects for the VR lab, she said, and collaboration with companies off-campus is actively encouraged, contributing to opportunities for SUNY Oswego student internships.